"War" is a non-fictional, progressive metal rock opera featuring: Mark Boals (Ring Of Fire), Vitalij Kuprij (Artension), Andre Vuurboom (ex-Sun Caged), Irene Janssen, Lance King, Bjorn Jansson (Tears of Anger/Imaginery). All the music was composed by Lars Eric Mattsson. 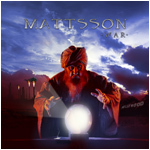 Complex arrangements and highly original compositions fill up Mattsson's(without a doubt) heaviest release to date. War - a rock opera about the state of this planet we call the Earth. • Deep In The Shadows. • This Is The End. Mark Boals - Lead Vocals on "Deep In The Shadows". Björn Jansson - Lead Vocals on "This Is The End"
André Vuurboom - Leed Vocals on "Smoke & Mirrors". Lance King - Lead Vocals on "Your Dream"
Irene Janssen - Lead Vocals on "Where's Our Chance" and "A Dreamer's Lullaby"
Cocki Sarling - Lead Vocals on "Requiem" and choirs.